Your information has been received. Please check your inbox right away for the confirmation email I just sent you. (Please also check your bulk/junk/spam folder as sometimes messages are mistakenly filtered as such). The email will be from “Mike Whitfield”. You MUST confirm your address by clicking on the link in this email. This quick extra step is to ensure that no one else is signing you up to receive information without your knowledge. I take your privacy very seriously. 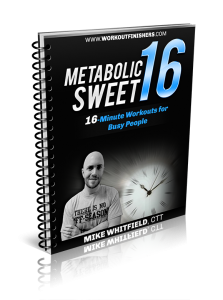 Once you confirm your address by clicking on the email I just sent, I’ll immediately send you a follow-up email with a download link to the Metabolic Sweet 16 manual. Please allow up to 1 hour for the email to arrive in your inbox. This also allows me to send you the finisher of the day. Check your email NOW to get Immediate Access! Thanks, and enjoy the workouts and finishers! P.S. If you have any questions, please email support [at] workoutfinishers.com. We’ll be happy to help you.